If you love Girl Scout cookies just as much as we do, then you are going to love these homemade Do Si Do cookies. No longer will you need to hunt these cookies down. Instead, you can make them in the comfort of your own kitchen. 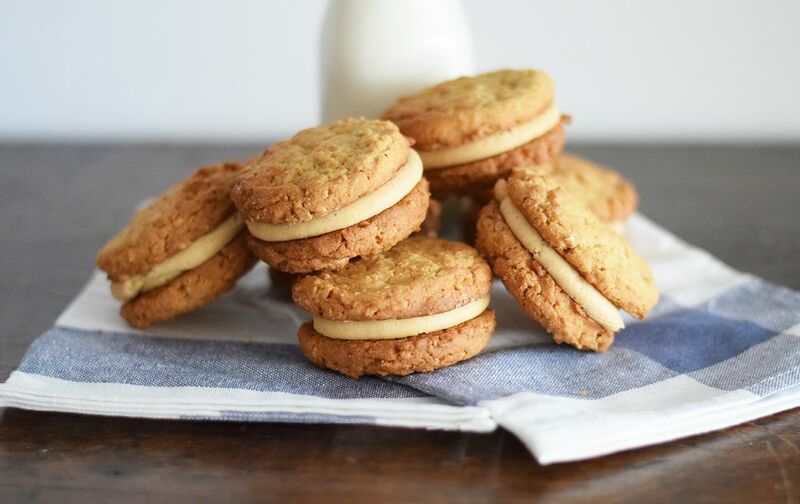 These insane peanut butter oatmeal cookie sandwiches go by two different names: Do So Dos and Peanut Butter Sandwiches. Both involve a delicious, crunchy peanut butter oatmeal cookies and a decadent peanut butter filling. And although the boxed kind is delicious, the homemade kind is king. Get the kids involved mixing up the dough and stuffing the cookies with the peanut butter filling. The recipe makes a lot of filling, so feel free to stuff the cookies as liberally or sparingly as you desire. Any leftover filling can be used to frost a few cupcakes or some chocolate brownies. Yum! You can make the filing ahead and store it in the refrigerator until you are ready to use. But we recommend no longer than three days. Sift together the flour, baking soda, baking powder, and salt in a medium-sized bowl and set it aside. In the bowl of a stand mixer, beat together the butter, peanut butter, and sugars until creamy. Scrape down the sides of the bowl and add the egg and vanilla. Beat until combined. Again, scrape down the sides of the bowl and add the dry ingredients, beating on low speed, until incorporated. Fold in the oats until evenly distributed. Use a small cookie scoop to create even balls. Place the balls a few inches apart on a parchment-lined baking sheet. Poke a hole into the center of each cookie with a skewer or toothpick. Bake for about 10 minutes or until golden brown. Remove the cookies from the baking sheet and place on a cooling rack. While the cookies are cooling completely, prepare the frosting filling. Beat together the butter, vanilla, peanut butter, powdered sugar, heavy cream, and salt in the bowl of a stand mixer, or use a hand mixer. Beat until completely combined and fluffy. Add a little more heavy cream if the frosting is too stiff or a little more powdered sugar if it is too moist. Once the cookies have cooled completely, match them up by size. Then place the frosting in a piping bag and pipe the entire flat surface of one of the cookies. Sandwich the other cookie on top of the icing. Repeat with remaining cookies. Serve immediately or store in an airtight container.